National defense needs have pushed back the frontiers of science and technology since time immemorial. Mechanics, chemistry, medicine, mathematics, psychology, astronomy, electricity, and as of the late nineteenth century, electronics. Astronomy was useful as a navigational tool and required a very sophisticated knowledge of geometry and algebra to make it accessible to seafaring men, cartographers, and land surveyors. Since the early 1900s, radio astronomy has played a huge role in the advancement of super-sensitive receiver designs. Most people think of information arriving to them in two or maybe three forms: sound, visible light, and some (but not many) even consider radio waves. As over-the-air AM and FM radio broadcasts die out, even fewer people are aware of radio waves; they certainly don't think of their WiFi or cellphone signals as radio or anything else for that matter ((i.e., oblivious to what makes them work). Certainly, only a very small percentage ever consider that night sky objects - which of course are there during the daylight hours, too - emit electromagnetic radiation at frequencies other than those of visible light. In fact, it has been discovered over the last century that much more information exists outside the visible light band than within it. Pulsars, black holes, and much of the history of the universe would not be known if not for the study of energy other than that which we can see visually. When this article appeared in 1948, Dr.s Arno Penzias and Robert Wilson had not yet, using the Bell Telephone Labs sugar scoop antenna in New Jersey, identified the cosmic background radiation left over from the universe's creation. 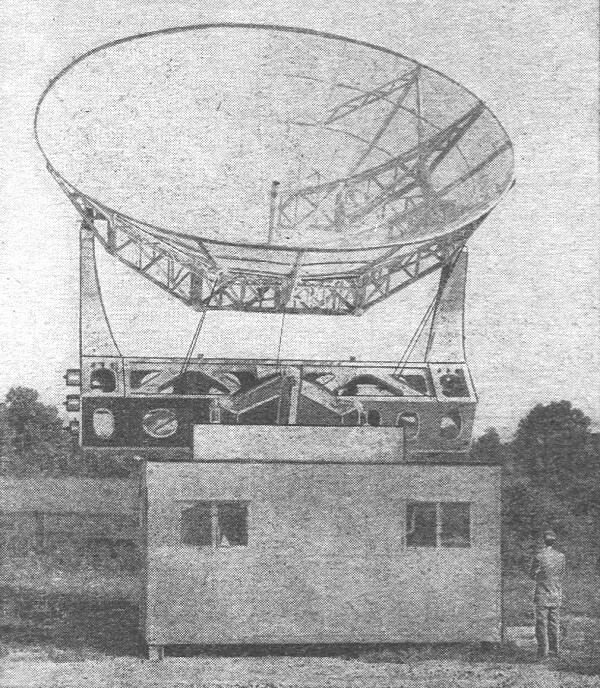 Front view of the 25-foot Wurzburg antenna beamed at the sun. 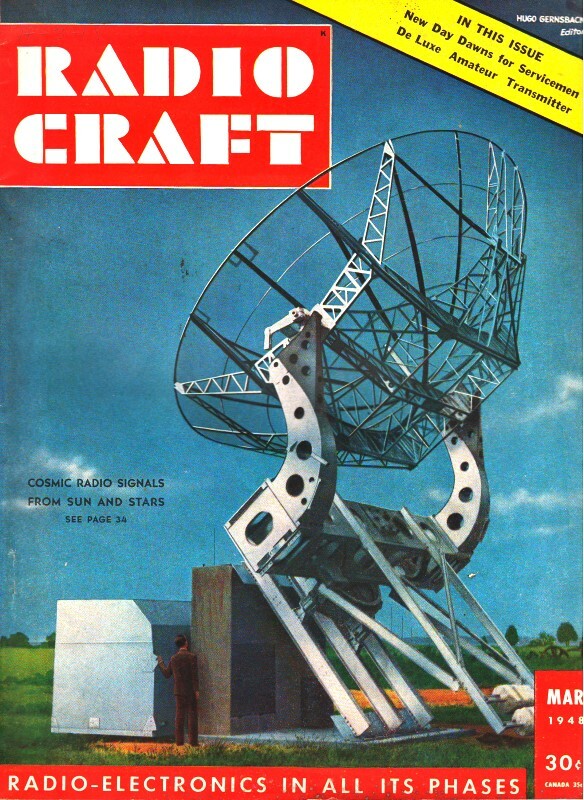 The giant equipment illustrated on our cover and on this page is nothing more nor less than a radio receiver. Further, it is a radio which receives static only! Building a receiver to pick up static may seem pursuit of the nonessential, but the designer of this set went even further. He built it to reject practically all the crackles and pops we get on our broadcast radios and to receive static on very high frequencies only - on the wave lengths at which the sun and stars radiate. Scientists of the Bureau of Standards believe that knowledge of this cosmic static - particularly of the radio waves generated by the sun - may be very useful to communications engineers, astronomers, and meteorologists. It may help to expand greatly our knowledge of the universe, and answer the old question: what effect have the stars and sun on this world and on human life? Ordinary static is too well known to the broadcast listener, particularly those living within range of that great "radio center" of terrestrial static - the Caribbean thunderstorm region. Individual flashes of lightning there combine to produce steady crashing, which is transmitted over great distances. Intensity of atmospheric noise drops off as the frequency increases, and finally ceases to be a practical problem. At that point cosmic radio noise takes over. Heard as a low, steady hiss, it may become an important problem to the listener on high frequencies as radio equipment is improved. Already advances in design of both v.h.f, and u.h.f. equipment have greatly reduced internal noise from tubes and other components. High-frequency radio noise may then become the factor which will limit the sensitivity of FM, television, microwave telephone, and similar equipment. FM radio signals suppress this type of static within a certain range of the transmitting station. At considerable distances from lower-power stations the strength ratio between the FM program and the cosmic noise might be such as to drown out the program completely. So the ordinary listener may find noise from the sun and stars an immediate and practical subject of interest. The project, which use the great Würzburg parabolic antenna shown here, will observe and analyze radio noise generated by the sun, determining the range of frequencies in the solar broadcasting spectrum and the strength at which they can be received on this planet. It will also attempt to correlate solar noise with other solar, interstellar, and terrestrial phenomena. Two of these parabolic mirrors are now installed at the propagation laboratory of the Bureau of Standards at Sterling, Virginia. Twenty-five feet across, they can capture a large cross section of the solar energy beamed at the earth. The mirrors are controlled automatically, like an astronomer's telescope, to follow the sun constantly through the day. By using 2 receivers, different types of studies can be undertaken simultaneously, or a broader band of frequencies can be followed. The first receiver - now being installed - will be used initially for studies ranging 480 to 500 mc. Solar noise appears to be fundamentally the same as cosmic noise, and is heard as a steady hiss whenever the operator substitutes a pair of headphones for his recorder. It has also an undulating component superimposed on the stable noise, with variations sometimes of great rapidity, which sound like puffs or swishes lasting a second or less. The swishes sometimes overlap, resulting in a grinding noise. This may manifest itself on the screen of a standard television set as streaking or picture jumpiness. Occasionally there are intense, prolonged bursts of solar transmission lasting several hours (see Sunspots and Radio, by Harlan True Stetson, in Radio-Craft, February, 1948). These cause a radar to "go blind" when pointed in the sun's direction. Like many other important scientific projects, the cosmic-noise study started as an amateur effort. The existence of cosmic radio waves had long been suspected - they had even been given a name, the Jansky effect. Among the students of this effect was an Illinois radio engineer, Grote Reber, who built a large sheet-metal parabola and for some years spent most of his nights collecting records from various parts of the sky. Among his important discoveries was that the center of the Milky Way is a powerful source of cosmic radio energy. His work attracted the attention of the Bureau of Standards, already interested in the problem of the sun's effect on radio propagation. Unquestionably the leading student of cosmic radio in the United States, he was called in to head the solar radio study project, exchanging his sheet metal parabola for the big Würzburgs. The, home-built mirror, however, is still doing duty in studies of radiation from the stars. The Bureau, at present chiefly interested in the sun's broadcasts, has 2 important problems to solve in the field - of cosmic noise: first, the question of intensities-vs-frequencies - in other words, on what bands are the stars and star-clouds radiating, and what bands come in strongest; second, mapping the sky's sources of cosmic signals. The Milky Way center is already known to be a strong source. Another one is in Cygnus (the Swan). Cause of the radiations is not definitely known. It has been suggested that, because of the similarity of the sound produced in the radio receiver, it may be due to thermal agitation of charged particles. The billions of stars which constitute our galaxy, say the Bureau's scientists, throw off a large amount of material which expands and tends to fill from the intervening space as a very thin gas. These atoms of gas may be ionized by starlight, producing positive and negative particles which radiate both visible light and radio waves. A notable feature of the radar method of exploring the heavens is that such areas of activity may be located even though they may be hidden (as in the case of the Milky Way center) by dense dark clouds which would baffle astronomers. The "electron telescope" may extend the knowledge of the astronomer as much as the electron microscope has already broadened the horizons of the searcher into the realm of the infinitesimally small. Practical applications of the new study are expected to be immediate. For example, a radio sextant might be built which would shoot the sun by noting the direction of arrival of solar noise. Such an instrument would be a boon to navigation in foggy areas. Knowledge of solar radiation conditions would also be valuable in short-range forecasts of radio propagation. But by far the greatest value of the study is likely to be the gaining knowledge of things not now understood and possibly not dreamed of theory. For example, when Grote Reber pointed his radio telescope at the Milky Way center, he rather expected to find a center of radio noise intensity. Most galaxies have a dense central nucleus, but the center of ours - if it exists - is hidden in dark clouds presumably of cosmic dust. The burst of signal strength from that area confirmed the suspicions of astronomers, and proved that the radio telescope could make discoveries denied even to Palomar's great light lens. But no one knows the cause of the intense source of signals in the constellation of Cygnus. Investigation of this and other discoveries which are almost certain to be made is likely to give us a new grasp of the universe, and will more than likely help to give us better radio reception right on this earth.